The Incredible Hulk Presents- BLOOD FOR THE BARON!!! Forum member antarctica has just discovered this title; The Incredible Hulk Presents by Marvel UK - it contained GI Joe reprint under the title of Action Force! There were twelve issues, of which I have tracked down issues #2, 4 and 8. The Joe strips each appear to be split across three issues. 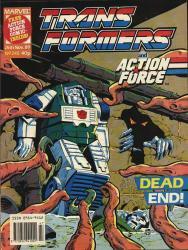 Issue 8 also has a splash bubble on the cover stating "FREE ACTION FORCE COMIC - INSIDE!" This is the exact same cover date as Transformers #245, so I assume it is another copy of the the Divided We Fall pullout. Does anybody have these? I'd be very interested to know what the final reprint strip was, as to the best of my knowledge MUK never did publish the final chapter of the Cobra Island saga from GI Joe #76. The Baron wrote: Forum member antarctica has just discovered this title; The Incredible Hulk Presents by Marvel UK - it contained GI Joe reprint under the title of Action Force! They did another Special Mission issue instead in there next collected comic Baron I was hoping to read more of the civil war, I ended up buying it from Milehighcomics instead. Do you know which strip, please? Do you have the actual comics? This was the last special http://yojoe.com/comics/sm/sm23.shtml I don't unfortunetly after Transformers was gone I set about buying original US issues where I could. I meant the Hulk comics, I want to know which GI Joe issue was reprinted in #10 - 12. Brilliant! Thank you very much!